File sync and share can increase productivity, but, unfortunately, it can also decrease security. After all, if files are shared more easily, they can more easily fall into the wrong hands. So how do you choose a solution that both increases productivity and keeps your information secure? This white paper can help you make that choice. 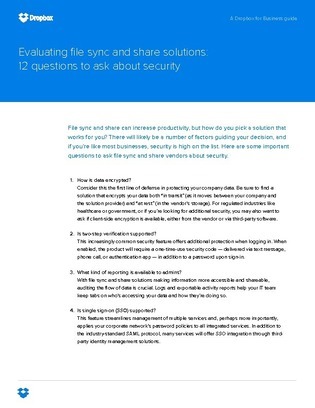 It outlines the twelve questions you need to ask vendors to ensure you’re getting the most secure file sync and share service possible. Read on to learn how to protect your data, no matter how it’s shared.